Hurricane Patricia nears Mexico at record strength. Hurricane Patricia, near peak strength, as it approached Mexico’s west coast on Friday morning. Update, Oct. 23, 2015, at 7:30 p.m.: Hurricane Patricia has made landfall near Cuixmala, Mexico, about 55 miles west of Manzanillo with estimated maximum winds of 165 mph, according to the National Hurricane Center. 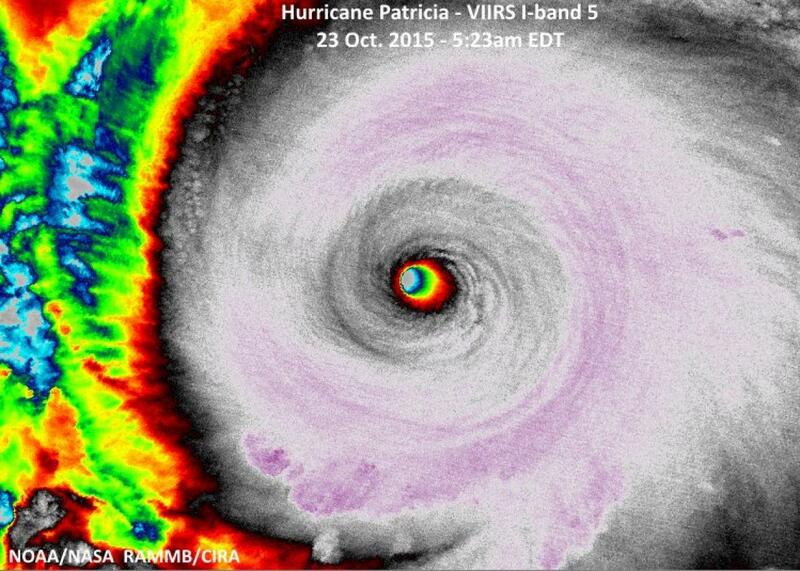 This makes Patricia the strongest hurricane ever recorded to make landfall on Mexico’s west coast. Original post, Oct. 23, 2015, at 11:35 a.m.: Over the past day or so, a phenomenal episode of strengthening has pushed Hurricane Patricia into the record books. Now, as the strongest hurricane ever measured—with 200 mph sustained winds—Patricia is just hours from making landfall in Mexico. The National Hurricane Center, with official forecasting responsibility for the Atlantic and eastern Pacific, all but ran out of words to describe the storm’s ferocity, labeling it “potentially catastrophic” and “incredible.” On Twitter, professional weather watchers went a step further, marveling at the storm’s record-breaking ability and fearing for Mexico’s coastal cities. Such a scenario—a quickly strengthening storm of unprecedented strength headed straight for land—is the stuff of meteorologists’ nightmares. As of Friday morning, Patricia was a strong Category 5 hurricane—after strengthening from just tropical storm strength a day earlier. Still, calling Patricia a Category 5 underestimates just how ferocious this storm is. Patricia is headed for a landfall between Manzanillo and Puerto Vallarta on Mexico’s southwest coast on Friday. The storm threatens to be the strongest ever to hit Mexico’s Pacific coast, surpassing a 1959 hurricane that also ranks as the deadliest in that part of the Pacific. As it moves inland, Patricia is expected to produce up to two feet of rain in Mexico’s coastal mountain range, creating a risk of flooding and mudslides over a vast area including Guadalajara, the country’s second-largest city. As of Friday morning, Mexico is scrambling to prepare for Patricia. Three states—Jalisco, Colima, and Nayarit—have declared states of emergency. In Colima, officials handed out sandbags. Nearly 400,000 people are in the storm’s path. Patricia has now surpassed 1997’s Hurricane Linda, which stayed safely off Mexico’s west coast, as the strongest known storm in the eastern Pacific, and 2005’s Hurricane Wilma, as the strongest known storm in the Western Hemisphere. It may have also surpassed 2013’s Typhoon Haiyan, which devastated the Philippines, as the strongest known storm in world history. It’s difficult to compare tropical cyclones in the western Pacific, called typhoons, and eastern Pacific hurricanes if only because routine aircraft measurements don’t exist in the western Pacific. Unlike Patricia, Haiyan was never directly measured by an aircraft, so we don’t know its true intensity. Over the past 30 hours, Patricia’s central pressure has fallen by 114 millibars, from 994 to 880—possibly beating the world’s record for fastest intensification. Since lower air pressure drives faster wind speeds, such a fast intensification has greatly increased the storm’s strength—Patricia strengthened by 100 mph in 24 hours, the most in the era of complete data coverage by weather satellites. This historic data was collected by a hurricane hunter aircraft flying through the center of Patricia, which departed the storm as it was still strengthening. Shortly after the research plane left, satellite estimates of Patricia’s intensity broke the Dvorak scale, peaking at 8.3 on the 8.0 scale. In fact, Patricia is now very close to the theoretical maximum strength for a tropical cyclone on planet Earth. If there is any good news, it’s that Patricia’s incredibly strong winds are concentrated into a narrow region near its core. The latest National Hurricane Center advisory shows Patricia’s peak winds are confined to a span of just 15 miles across the center, which should help limit its impact at the time of landfall. Still, that’s little consolation for those in the storm’s direct path. 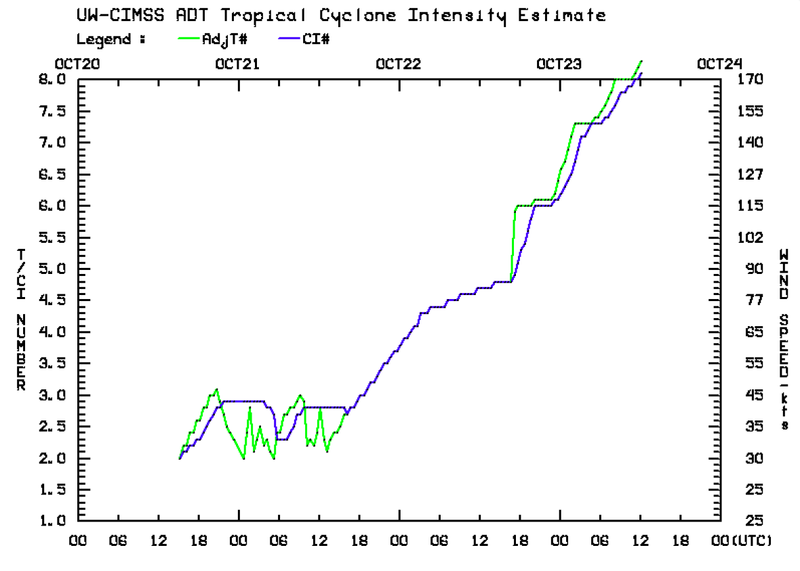 According to the Dvorak scale, a satellite-based estimate of hurricane intensity, Patricia is literally off the charts. Patricia’s rapid intensification is linked to the current strong El Niño in the Pacific, which, along with global warming, has helped produce record-warm ocean temperatures in the region near where it formed. Also in Slate: How climate change made Hurricane Patricia worse.